Patch 7.3.5 is switching up the way we level our alts in more ways than one. 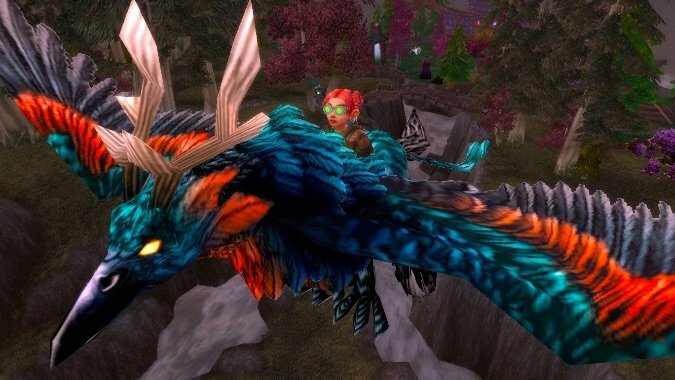 In addition to the introduction of level scaling to low-level zones, Blizzard is getting rid of expansion-tied flight requirements in Northrend, Pandaria, and Azeroth. Right now, players taking alts through low-level content need to pay to fly in each of these expansions. This cost is on top of the initial cost for Expert Riding, which simply unlocks the ability to ride flying mounts. Tomorrow, that’s no longer the case. With the new change, players only need to purchase Expert Riding to unlock flying in all three expansions. As someone who just finished leveling yet another alt through all this content — man, is this ever a welcome change. The biggest issue I ran into while leveling was flight. The only way to unlock flying early in Pandaria was to get my hands on an elusive tome through the Black Market Auction House. By the time I finally found one for sale, I was nearly max level for Pandaria anyway. This ended up rendering the whole process pretty useless. At that point, why should I bother? Players will want to make note, however, that these changes do not apply to expansions with Pathfinder achievements. In other words, you’ll still need Draenor Pathfinder to get around on Draenor. And as far as Legion is concerned, you’ll still need Broken Isles Pathfinder, Part Two. However, both of these achievements are account-wide. Once you have them on one character, you won’t need to get them again. Blizzard seems to be a fan of the Pathfinder-style flight unlock, so it’s likely this will continue in future expansions as well. Between the flying change and the level scaling changes, alt leveling should be a better, smoother experience. I know when Allied Races finally become playable, I’m looking forward to a much more pleasant leveling journey overall. Until then, I think I’ll dust off that abandoned Worgen alt I’ve got kicking around, and take to the skies with much less hassle.